Saffron: Saffron is the upper most colour of the flag and is a symbol of courage and selflessness. White: The white colour in the Tiranga represents honesty, peace and purity. It highlights the importance of maintaining peace in the country. Green: The green colour of the flag represents faith and chivalry. It is a symbolism of prosperity, vibrance and life. Ashoka Chakra: The Ashoka Chakra or the Dharma Chakra (Wheel of Law) has 24 spokes and appears on the number of edicts of Ashoka. The Indian national flag represents India’s long struggle for freedom and is a national treasure. It signifies the status of India as an independent republic. The flag came into being in its present form at the meeting of Constitutional Assembly on 22 July 1947. Since then it has served as the National Flag of the Dominion of India from 15 August 1947 to 26 January 1950 and, thereafter, as the national flag of the Republic of India. The Indian National Flag was designed by Pingali Venkayya and contains three equal strips of saffron, white and green. The second flag was hoisted in Stuttgart in Germany on August 22 1907 by Madame Cama and her band of exiled revolutionaries in 1907. 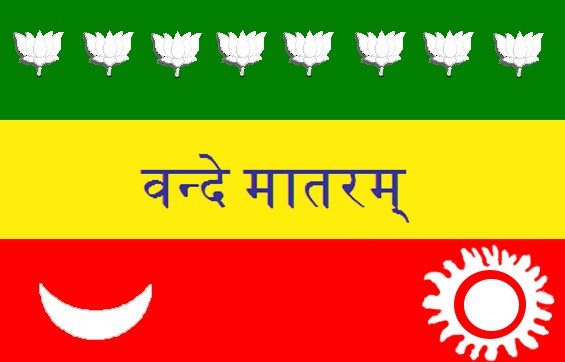 That flag had green at the top, saffron in the center and red at the bottom, the green standing for Islam and the saffron for both Hinduism and Buddhism. The flag had eight lotuses in a line on the green band representing the eight provinces of British India. The words Vande Mataram, in the Devanagari script, inscribed the central band. On the lowest band, towards the hoist of the flag, a crescent, and towards the fly, a sun appeared. Bhikaiji Cama, Veer Savarkar and Shyamji Krishna Varma jointly designed the flag. 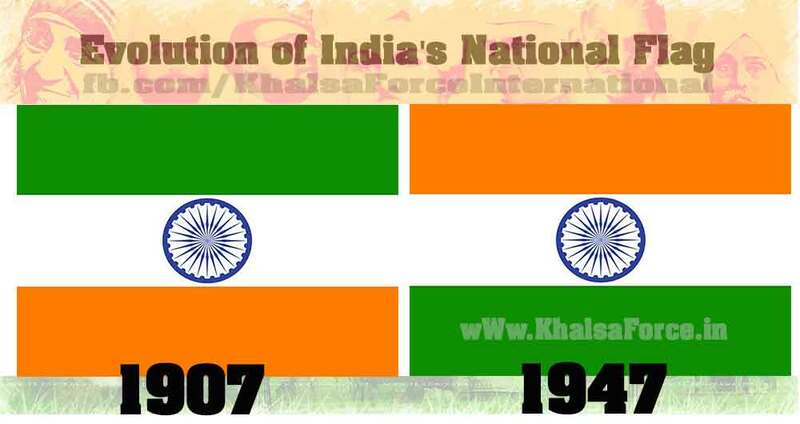 1904-06:: The history of the Indian flag dates back to pre-independence era. It was during 1904-06 that the first Indian flag came into being. It was made by an Irish disciple of Swami Vivekananda. Her name was Sister Nivedita and after some time this flag came to be known as Sister Nivedita’s flag. This flag was coloured red and yellow. Red signified the freedom struggle and yellow was a symbol of victory. It had the words “Bonde Matoram” in Bengali written on it. Along with it the flag contained a figure of ‘Vajra’, weapon of god ‘Indra’, and a white lotus in the middle. The ‘Vajra’ is a symbol of strength and lotus depicts purity. 1906: After Sister Nivedita’s flag, another flag was designed in 1906. It was a tricolour flag with three equal strips of blue (top), yellow (middle) and red (lower). In this flag the blue strip had eight stars of slightly different shapes. The red strip had two symbols, one of sun and the other of a star and a crescent. The yellow strip had ‘Vande Mataram’ written on it in Devnagiri script. In the same year another version of this flag was created. It was also tricolour but its colours were different. It had orange, yellow and green and came to be known as ‘Calcutta flag’ or ‘Lotus flag’, as it had eight half opened lotuses on it. It is believed to be designed by Sachindra Prasad Bose and Sukumar Mitra. It was unfurled on 7 August 1906 at Parsi Bagan Square, Kolkata. It was a “boycott day” against the partition of Bengal and Sir Surendranath Banerjee hoisted this flag to mark the unity of India.